KIITEE 2016 Application Form: Kalinga Institute of Industrial Technology (KIIT), Bhuvaneshwar has been conducting the KIIT Entrance Examination (KIITEE) every year for the admission to the various streams in the UG engineering courses (B.Tech). KIITEE Application Form 2016 and prospects will be available through online mode only. Applicants should follow some rules and regulations to apply for the KIITEE online application form 2016. Our website provides you all the complete information regarding the KIIT Engineering Application Form 2016. If you feel any difficulty while applying for the KIITEE 2016 Application Form, then leave a comment below. Our website team member will clear your doubts. Candidates should complete the KIITEE online registration 2016 before the last date of the application form submission. Applicants who have passed 10+2 examination in 2013/2014 or appearing in 2016 exam are only eligible to apply for B.Tech (4 Years) with 60% marks in the Physics, Chemistry and Mathematics. They should have studied in regular full time in their schooling and college. 4. KIITEE 2016 Application Fee: There is no Application Fee. Candidates have to apply online at http://www.kiitee.ac.in or http://www.kiit.ac.in or they can download the KIITEE Application Form 2016 from the website. 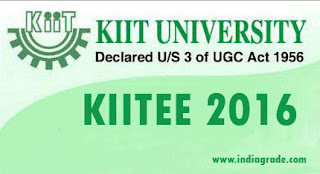 Candidates should fill the online application form for KIIT engineering entrance exam 2016 carefully without any error. Then submit the KIITEE online application form 2016 and take the print out. Then affix recently taken passport sized photo on the application form and you should ensure that you signed in the form. Enclose all the necessary documents with the application form including the Class X mark sheets. The duly filled application form with all required documents will reach the KIIT University by registered post or speed post or courier.